Providing a modern interpretation of the geological history of Britain by placing this in historic, social and artistic contexts, GeoBritannica explores what nature and humankind achieve when united. 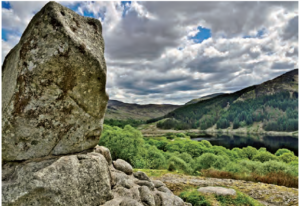 We highlight the geology of the Southern Uplands and Galloway and explore the long-standing artistic significance of the region, from Bronze Age cup-and-ring markings, to the ‘Glasgow Boys’ in the twentieth century. Figure 23.2 Bruce’s Stone and Glen Trool, Galloway (55.089493, −4.496750). Photo: Shutterstock 150822881 ©Kevin Eaves. In 1306/7 Robert the Bruce took refuge here as a fugitive in the rugged landscapes of western Galloway. His memorial stone is below the rocky granitic crags that lead vertiginously up to the peak of Merrick, at 843m. This round-peaked, glacially dissected plateau founded mostly in Lower Palaeozoic rocks is mountainous in places and much travelled through; it must be crossed to reach or leave Scotland by land. For northward invaders and colonizers – Romans, Angles, Normans and English – it was the necessary land route into wealthy Midland Scotland. The alternative before turnpikes and railways was by boat along the eastern seaboard, the route a sickly John Keats took back down to London from his Scottish hike in the autumn of 1818. The steep-cliffed coast here is due to resistant Silurian outcrops, a challenge for construction of this branch of the rail link from Edinburgh to London. From Dunbar to Cockburnspath and again from Burnmouth to Berwick between its numerous cuttings the traveller gets glimpses of spectacular coastal views: folded and faulted Lower Palaeozoic greywackes and the vivid red-brown hues of the Old Red Sandstone – perhaps even a hopeful glance at Pease Bay, towards the site of Hutton’s unconformity at Siccar Point. Dunbar itself, like Berwick, had a strategic position; with its castle on a volcanic outcrop it was a much fought-over part of Anglian Northumbria for several centuries. Neighbouring East Barns featured a notable Mesolithic site. Here, prior to a quarry extension, geophysical surveys and rescue excavations discovered post-holes for a 6m-diameter roundhouse whose hearth deposit was dated to 10ka, the earliest preserved house in Scotland. The highest ground over 600m is in the Lammermuir, Ettrick, Lowther and Galloway Hills, all deeply glaciated, the rounded summits with blanket peats, valley-fringing crags and boulder fields. As in Grampian, the Galloway massifs of Criffell, Cairnsmore-of-Fleet, Merrick and Cairsphairn are rooted in resistant granitic and intermediate intrusions. Their corries hosted the nuclei of Quaternary ice that flowed out into the Irish Sea and away southwards, carrying within them the tell-tale igneous stones that became glacial erratics. 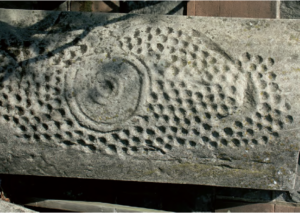 Figure 23.3 Cast (c. 40x25cm) of exquisite cup-and-ring petroglyphs exhibited outside Kirkcudbright’s Stewartry Museum. This example is extraordinarily geometrical and may depict a central henge monument with surrounding close-packed hut circles. Away from the granites, the lower landscapes are pastoral country with scattered NE–SW trending Siluro- Ordovician outcrops – gorse-covered, rock-slabbed ridges that end in skerried shores or coastal cliffs, many of which carry Bronze Age cup-and-ring markings (Fig. 23.3). The foothills of Cairnsmore feature the striking hillside Neolithic court tomb of Cairn Holy, its massive dark exhumed greywacke slabs fanning open to the sky like brutally broken bad teeth. The cliffed fastness of Criffel’s southern faulted margin, with its vivid-pink felsitic and porphyritic dykes, hosts the Iron Age broch of the Mote of Mark. The Novantae here were subdued by Agricola in AD 82. From the Rhinns of Galloway in the far west, he briefly (perhaps optimistically) contemplated a single-legion invasion of Ireland. The early conversion of the Southern Uplands Brythonic tribes to Christianity was aided by the construction of huge masoned preaching crosses in local stone that stood near main routes or early churches. The largest and unique survivor is the early-seventh-century Ruthwell Cross located close to the coast a few miles east of the Nith estuary. This 5.5m high carved Permian sandstone block has panels that feature both figurative work (e.g. shepherd with lamb,birds eating grapes on the vine) and decorative themes. Most famous of all are the runic lettered inscriptions discussed in Chapter 16. Cultural and architectural scholar Nicholas Pevsner regarded the Ruthwell Cross, together with that at Bewcastle,as‘the greatest achievement of their date in the whole of Europe…’(but he knew nothing of Ireland). The closeness of Ulster led to the emergence of both Ulster Scots and Galloway Irish as cultural groupings in modern times. Such links originated after Elizabeth I’s ‘plantations’ and later during the Jacobite troubles and the Irish Famine. A stage-coach service subsequently wended its slow way from Stranraer across once notorious roads to Carlisle and southwards, amply documented in the letters of Viscount Castlereagh of Castle Stewart in Down to his wife Emily, staying with her sister at Blickling Hall, Norfolk. By 1859–61 the rail link from Carlisle to Stranraer via Dumfries opened and today the trucks of Ulster carriers roar along the only partially upgraded A75. They bypass places like Tongland, up the River Dee from Kirkcudbright with its striking Telford bridge and a beautiful concrete Art Deco hydro-electric station. The most efficaceous routes to and from Glasgow and the western Midland Valley are provided by geological structure: low ground along the faulted Permo-Triassic rift basins of Dumfries, Lockerbie and Thornhill. These linked the earliest Roman marching routes, the former a rich source of fine red-brown building and monumental sandstone, notably at the Locharbriggs quarries. The M74 now screeches through the Lockerbie basin into the Lower Palaeozoic core via the Beattock pass, with its nod to glaciated Moffat valleys and headwaters of the Clyde. It was here in the Lowther Hills of south Lanark and northern Dumfriesshire that lead, zinc and gold were worked around Leadhills and Wanlockhead (the highest Scottish villages, around 450m); gold in the sixteenth century and lead/zinc from the early seventeenth century to the 1930s. The lead was blasted and shovelled from vein ores, and the gold panned from valley-floor alluvial deposits. The latter provided coinage and crowns (2 kilograms in total weight) for James V and his Queen, Mary of Guise; the metal may still be panned (by extreme optimists) under licence. In their spare time the lead miners set up an early working-men’s library in the 1740s, supposedly the oldest subscription library in the Island. From late-medieval times the narrow north–south glens and valleys of the central Southern Uplands hosted important ‘clan’ groups (Humes, Dixons, Kerrs, Johnstons, Scotts, Elliots, Irvings, Maxwells and others). They were cattle-breeding pastoralists with a marked tendency to brigandage and feuding, both with kinsfolk, neighbours and over the border. Pacification by James VI led eventually to a largely legal cattle trade along the drove roads of Nithsdale southwards. One popular route led the skinny but hardy black Galloways from Carlisle far south-east to fatten up on the water meadows of East Anglia prior to sale at Smithfield. A few decades after Union, numerous market towns were planned and (re)built. Factory industries developed, including boot-and-shoe, weaving and bobbin-making, powered by water and steam. Dumfries and Stranraer were and are the largest towns. Dumfries, the old town constructed from Locharbriggs sandstone, is the cultural and administrative centre of central Galloway. It lies snugly in the hollow of its Permo-Triassic rift basin, shaltered below the smooth leeside slopes of Criffell. Its bloody history, occupied and/or plundered by the English six times between 1300 and 1570, began when the Bruce is said to have murdered his rival the Red Comyn in front of the Greyfriars altar. The town was where philosopher and cleric Duns Scotus took his orders. A supporter of the Bruce, a student in Paris and resident of Cologne, his sarcophagus in that place’s cathedral bears the splendidly European inscription: Scotia me genuit. Anglia me suscepit. Gallia me docuit. Colonia me tenet. (‘Scotland brought me forth. England sustained me. France taught me. Cologne holds me.’). Better known is the poetic genius of the Scottish Enlightenment, Robert Burns, who spent the last third of his life in the town as an exciseman; the thirsty fieldworker can still take a ‘haf-and-ahaf’ in his honour at the bar of his favourite howff. The port town of Stranraer on Loch Ryan is the administrative centre for Western Galloway, the ferries to Ulster now served from Cairn Ryan. Like Dumfries, its location and anchorages are determined by its location in a fertile lowland Permo-Triassic rift basin. The axe-head shaped Rhinns peninsula of resistant Ordovician greywacke to the west is the flanking upland to the double embayments of Loch Ryan and Luce Bay. At nearby Kirkmadrine the oldest surviving Christian standing stones in Britain are fifth to early sixth century. One has the theological inscription Initium et Finis (‘Beginning and End’); a pronouncement that Playfair and Hutton would doubtless have profoundly disagreed with. Across Luce Bay on the Whithorn peninsula the poorly documented Saint Ninianlived and worked in the early Christian era, founding the first church in Scotland, the Candida Casa (White House) around AD 400. By the late eighteenth century newly planned settlements and extended medieval towns prospered in the region, from Wigtown in the west to Peebles and Galashiels in the east. The region’s wilder places (Lowthers, Lammermuirs, Solway) grew famous through Scott’s ‘Waverley novels’, a literary output that, with Burns’s poetry, can fairly be said to have created the image of Romantic Scotland, perhaps to its detriment. Once linked into the national rail network, the region became popular amongst the more discerning and wealthy as a touristic and recreational destination. Its towns still have a special relationship with their surrounding agricultural hinterlands and proudly hold on to their special identities, many through the annual fiestas of ‘Common Riding’. Here in the nineteenth-century mill-towns with terrace-rows developed, eventually specializing in weaving fine woollen and silk yarns: Hawick and Galashiels survive; Peebles just; Langholm and others not. Landscape sculptor Andy Goldsworthy’s Striding Arches are located on the summits of Ordovician-age greywacke hills around Cairnhead Glen near Moniaive, a glaciated corrie and valley in the central Southern Uplands. Begun in 2002, they are four Romanesque-style barrel arches; 4m high dressed red-brown Permian sandstone from Locharbriggs, each visible from one other. They have inspired further collaborative efforts in landscape art: Alex Finlay, Alexander Maris and Susan Maris celebrate in poetry, photography and sound-sculpture the riverine confluences of Dalwhat Water that runs through Cairnhead Glen. 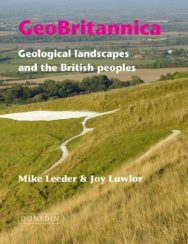 GeoBritannica: Geological Landscapes and the British Peoples by Mike Leeder and Joy Lawlor is out now published by Dunedin Academic Press priced £24.99. This extract originally appeared in the Revolution Issue of Books from Scotland published earlier in 2017.